Clone refers to a bootable backup of the Mac hard drive providing redundancy to your Macintosh Operating System as well as the data contained. The easy to follow cloning process can be backed up by other methods such as Time Machine so that your work does not get hindered even when a system update goes awry causing your Mac to crash. You can rollback your Mac OS X installation coupled with the cloning drill and make use of the synchronization software for keeping your clone updated as you perform incremental updates for booting other Mac devices whenever the need arises. Disk cloning can be of great benefit in creating an exact duplicate of the entire disk or certain parts if a partition is in place. The resultant clone becomes bootable if the original disk displays this quality. Hence you can create a backup of your operating system apart from your required documents. You can utilise your disk duplicate for booting your device. External drives like SDD or HDD are the best media which can suffice as a bootable disk clone. Since the disk cloning process is very time consuming, it might not seem to be convenient to proceed with the same on a frequent basis. However, subsequent runs of disk cloning diminish the time requirement as the removed or modified files are updated by the program. While planning a backup strategy, it becomes imperative to decide upon a combination of both regular backups and disk cloning. In such cases, you can opt for weekly or monthly disk cloning and daily backups. Click on the Apple menu and choose System Preferences if your current operating system is running. Next choose a disk from the Startup Disk section. Alternatively, you can press and hold the Alt(Option) key if your computer is turned off or if you cannot boot from the regular disk. This has to be done before turning the power back on. The Spotlight indexing is turned off for the destination drive prior to the initiation of the cloning process. For turning it on, you need to visit the Privacy settings from the Spotlight section under System Preferences. The original clone coupled with the subsequent incremental updates can serve as a potent data backup. No requirement is felt for any special software to read the files on a clone drive. You can access and copy these files easily and whenever required. It becomes imperative to get the cloning work done prior to installation of any QuickTime or Mac OS X updates and productivity applications. You can also boot off your clone if you incur the problems once again to keep working. Troubleshooting can be taken up whenever time permits so that you can re-clone the primary system back to the initial drive. A single drive having multiple partitions can be used for storing the clones of different Macs. This can be of great help especially for small business houses where incremental updates regarding each clone is not felt necessary on a regular basis. 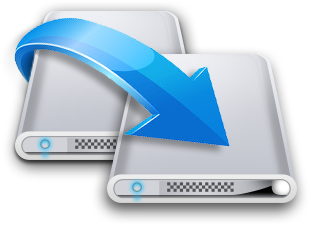 Coupled with Carbon Copy Cloner program, you can easily copy folders and documents from your Mac to external device which in turn can be used as a network storage device, USB stick or external hard drive connected with the computer. The copying function can also take place automatically when a regular time and date schedule is set for the same. The copies are also kept up to date for ensuring that all the changes made to the core document get reflected in it. A single license of this commercial Carbon Copy Cloner software comes with an unrestricted trial session of 30 days. The Carbon Copy Cloner program, gets installed in the Applications folder from where it can be launched by double-clicking. All backup and copy operations can be set up and controlled from this place. Clicking on the “Show Sidebar” icon displays all the copy tasks. The first backup using Carbon Copy Cloner might take time as all the files present in source and destination are compared and a list is prepared consisting of the items which need to be copied. It can take almost 30 minutes for the backup to complete wherein a “Recovery HD” is created by Carbon Copy Cloner for helping out if your computer faces any problem. The upcoming backups will run for just a couple of minutes. Download and install Carbon Copy Cloner. Next you will have to click on the box titled “Delete items that don’t exist on the source”. Finally, you will have to click on “Clone” for backing up your hard-drive. A clone can be used for booting any Macintosh supporting the installed Mac OS X version. This capability comes as a relief in the case of hardware failure of a business house owning multiple Mac devices. A portable hard drive is all you need for carrying around your virtual computer. Incremental backups and cloning serve as perfect complement to archival backups such as Time Machine.